Translocation of bacteria across the intestinal barrier is important in the pathogenesis of systemic sepsis, although the mechanisms by which bacterial translocation occurs remain largely unknown. We hypothesized that bacterial translocation across the intact barrier occurs after internalization of the bacteria by enterocytes in a process resembling phagocytosis and that TLR4 is required for this process. We now show that FcγRIIa-transfected enterocytes can internalize IgG-opsonized erythrocytes into actin-rich cups, confirming that these enterocytes have the molecular machinery required for phagocytosis. We further show that enterocytes can internalize Escherichia coli into phagosomes, that the bacteria remain viable intracellularly, and that TLR4 is required for this process to occur. TLR4 signaling was found to be necessary and sufficient for phagocytosis by epithelial cells, because IEC-6 intestinal epithelial cells were able to internalize LPS-coated, but not uncoated, latex particles and because MD2/TLR4-transfected human endothelial kidney (HEK)-293 cells acquired the capacity to internalize E. coli, whereas nontransfected HEK-293 cells and HEK-293 cells transfected with dominant-negative TLR4 bearing a P712H mutation did not. LPS did not induce membrane ruffling or macropinocytosis in enterocytes, excluding their role in bacterial internalization. Strikingly, the internalization of Gram-negative bacteria into enterocytes in vivo and the translocation of bacteria across the intestinal epithelium to mesenteric lymph nodes were significantly greater in wild-type mice as compared with mice having mutations in TLR4. These data suggest a novel mechanism by which bacterial translocation occurs and suggest a critical role for TLR4 in the phagocytosis of bacteria by enterocytes in this process. Bacterial translocation is the process by which enteric microbes pass through the normally impermeant intestinal epithelial barrier and into lymph nodes or the systemic circulation. This process may initiate the development of systemic sepsis and multisystem organ dysfunction syndrome by activating lamina propria macrophages, leading to the release of proinflammatory cytokines (1, 2). Alternatively, bacterial translocation may have a salutary role in the maintenance of gut immunity by allowing enterocyte-associated lymphocytes to sample gut Ags and develop immune tolerance to luminal contents. The mechanisms that govern bacterial translocation remain largely unexplored, although current thinking suggests that two pathways exist by which bacteria could traverse the enterocyte monolayer (3). The first route is “paracellular,” in which bacteria pass between adjacent cells (4). However, the intact intestinal epithelium is replete with tight junctions between adjacent enterocytes (5), which would be expected to prevent the passage of bacteria between cells. Alternatively, bacteria could pass through the enterocytes (“transcellular” passage). In support of this possibility, bacteria have been observed within the cytoplasmic compartment of enterocytes in vivo (6) and in cultured enterocyte monolayers (7), and bacterial translocation has been measured in vivo under conditions where the enterocyte monolayer remains intact (8, 9). These findings raise the possibility that enterocytes could internalize bacteria and that this could provide a portal through which transcellular bacterial translocation could occur. Importantly, the possibility that enterocytes could internalize bacteria and the fate of the internalized particles remain largely unknown. In macrophages and neutrophils, bacteria are internalized through the process of phagocytosis (10). Phagocytosis is initiated by the extension of a membrane-bound pseudopod around the bound particle, the exocytosis of preformed intracellular vesicles, and the subsequent rearrangement of the plasma membrane around the particle to form the phagosome (11). Recent reports have provided evidence that noninvasive bacteria may be detected within the cytoplasm of enterocytes, raising the possibility that phagocytosis of the bacteria by the enterocyte leads to their internalization (7, 12). Other nonprofessional phagocytes, including Chinese hamster ovary (CHO)2 and COS cells (11, 13), have been shown to undergo phagocytosis following transfection of a phagocytic receptor, suggesting that enterocytes could undergo phagocytosis as a mechanism for internalization of bacteria. Insights into the processes by which enterocytes could undergo phagocytosis have been somewhat limited by the lack of known phagocytic receptors for enteric bacteria on the enterocyte surface that could initiate this process. Recent experiments have shed light on a class of microbial recognition receptors that may be attractive targets to study for their potential role in initiating phagocytosis by enterocytes. The TLRs are named after a class of innate immune receptors in Drosophila that have been shown to play a critical role in the recognition of microbial pathogens by host cells and the initiation of the inflammatory response (14, 15). TLR4 has recently been shown to be important in the recognition of the Gram-negative bacterial cell component LPS (16, 17). LPS-mediated signaling through TLR4 stimulates IL-1R-associated kinase (IRAK) via MyD88 and MD2, and the subsequent recruitment of TNF receptor-associated factor 6 leads to the activation of the transcription factor NF-κB and the release of proinflammatory cytokines (18). We and others (19, 20, 21) have recently demonstrated that TLR4 is expressed on the apical surface of enterocytes, where it is capable of binding and internalizing purified endotoxin. This finding raises the possibility that TLR4 could participate in the uptake of bacteria and suggests a potential mechanism by which bacterial translocation could occur. We therefore hypothesize that TLR4 mediates phagocytosis of Gram-negative bacteria by enterocytes and that TLR4 is required for bacterial translocation in vivo. We now demonstrate that enterocytes can internalize Gram-negative bacteria via TLR4 and that the internalized bacteria remain viable within the enterocytes. HEK-293 cells that do not express TLR4 and are incapable of undergoing phagocytosis acquire the capacity for phagocytosis when stably transfected with functional TLR4. Finally, TLR4 was found to mediate phagocytosis and translocation of Gram-negative bacteria in vivo. Together, these findings raise novel insights into the mechanisms governing phagocytosis of bacteria by enterocytes and suggest potential pathways by which bacterial translocation could occur. IEC-6 and T84 enterocytes and J774 macrophages were obtained from the American Type Culture Collection (ATCC), Manassas, VA. IEC-6 cells were stably transfected with FcγRIIa cDNA, yielding FcγRIIa-IEC cells (herein called Fc-IEC), or with GFP-conjugated actin (BD Clontech) using LipofectAMINE 2000 (Invitrogen Life Technologies) according to the manufacturer’s protocol. CHO cells were obtained from ATCC and stably transfected with FcγRIIa (herein termed Fc-CHO) as described (11). HEK cells stably transfected with TLR4 and MD2 (herein called TLR4-HEK cells) were the generous gift from Dr. J. Chow (Eisai Research Institute, Boston, MA). HEK-293 cells were transiently transfected with TLR4 bearing a dominant-negative (dn) P712H mutation along with MD-2 (generous gifts from Dr. E. A. Kurt-Jones, University of Massachusetts Medical School, Worcester, MA) and pGFP (BD Clontech) to detect transfected cells using LipofectAMINE 2000. For ease of description, these cells will herein be named HEK-dnTLR4 cells. Biotin LH, rhodamine-labeled streptavidin, rhodamine phalloidin, and Oregon Green isothiocyanate were from Invitrogen Life Technologies. Rhodamine-conjugated donkey anti-rabbit IgG was from Jackson ImmunoResearch Laboratories. Abs against syntaxin 4 were from Chemicon, FcγRIIa was from Upstate Biotechnology, and TLR4 was from Santa Cruz Biotechnology. All other reagents were from Sigma-Aldrich. Sheep RBCs (SRBCs) were opsonized with goat anti-sheep erythrocyte IgG (at 1/10 for 1 h at 37°C in PBS) then added to confluent Fc-IEC or Fc-CHO cells (10 SRBCs/cell) in DMEM containing 10% FBS (for 1 h at 37°C). Noninternalized SRBCs were removed by lysis with ice-cold water for 30 s. Cells were then stained with rhodamine phalloidin (at 1/500 for 1 h at 23°C) or anti FcR as described (11). In parallel, nonpathogenic Escherichia coli (DH5a; Invitrogen Life Technologies) or Streptococcus sp. (ATCC strain B361) were labeled with Oregon Green (1 mg/ml in PBS for 1 h at 37°C) and then EZ-Link-Sulfo-NHS-Biotin (Pierce) as per the manufacturer’s instructions. Bacteria were incubated with confluent IEC-6, HEK-TLR4, HEK-293, or HEK-dnTLR4 cells on glass coverslips (106 bacteria/ml for 2 h at 37°C). Where indicated, cells were pretreated with anti-TLR4 (10 μg/ml for 1 h at 4°C), LPS (50 μg/ml for 1 h at 4°C), nonspecific IgG (10 μg/ml for 1 h at 4°C), cytochalasin D (100 μM; 1 h at room temperature), or IL-1 (100 IU/ml for 1 h at 37°C). After washing with copious amounts of ice-cold PBS, extracellular bacteria were labeled by incubation with rhodamine-streptavidin (at 1/500 for 30 min at 23°C). Detection of internalized, labeled bacteria and quantification of phagocytosis were performed by confocal microscopy (Olympus FluoView 1000). Under the Oregon Green filter set (488-nm excitation and 514-nm emission), both internalized and external bacteria could be detected. However, under the rhodamine filter set (550-nm excitation and 575-nm emission), only the extracellular bacteria were detected. CHO and HEK-293 cells that do not express TLR4, the addition of unlabeled bacteria, and treatment with rhodamine-streptavidin alone served as controls. For comparison purposes, J774 macrophages were incubated with labeled bacteria exactly as described above, and the phagocytic rate was determined in the same manner. The effects of LPS on macropinocytosis in IEC-6 cells were detected according to the methods of Ellerbroek et al. (22). In brief, IEC-6 cells were cultured to 70% confluence on glass coverslips in a 24-well plate and treated with LPS (50 μg/ml for 20 min or 6 h at 37°C), left untreated in culture medium, or treated with vehicle (PBS) alone for 6 h. Cells were then washed twice in DMEM and incubated with warm (37°C) medium containing 250 μl of 50 μg/ml Alexa Fluor 594-conjugated 10-kDa dextran (Invitrogen Life Technologies) at 37°C for 10 min. Dextran uptake was stopped by adding ice-cold PBS. After washing twice with 1-ml volumes of ice-cold PBS, cells were immediately fixed with 4% formaldehyde at 25°C and processed for immunofluorescence. The effects of LPS on the formation of actin-rich membrane ruffles in IEC-6 cells were assessed in two ways. First, IEC-6 cells that had been transiently transfected with pGFP-actin 24 h previously were perfused with in DMEM plus 10% FCS and transferred onto the stage of an Olympus FluoView 1000 inverted confocal microscope under ×60 magnification and imaged every 5 min. Where indicated, LPS (50 μg/ml) was added immediately before the onset of imaging. Second, IEC-6 cells were either left untreated or treated with LPS (50 μg/ml for 6 h at 37°C), fixed in paraformaldehyde, and then stained with rhodamine phalloidin and imaged by confocal microscopy at the plane of the coverslip to detect actin-rich membrane ruffles as described (23). IEC-6 cells that had internalized E. coli were treated with gentamicin (50 μg/ml for 3 h at room temperature), which kills all extracellular bacteria but does not enter the IEC-6 cell, and then subjected to 15 s of ultrasonic lysis and plated on agar. The number of CFUs after 24 h (at 37°C) was measured (12). Where indicated, cells were pretreated with cytochalasin D, Abs to TLR4, or 0.1% Triton X-100 (to allow gentamicin to enter the phagosome and kill internalized bacteria). In parallel, tosylated superparamagnetic beads (Dynabeads) were conjugated with LPS (1 mg/ml LPS in 0.1 M carbamate buffer (pH 9.5) for 24 h at 4°C) and then added to confluent IEC-6 cells (0.5 × 107 beads/ml for 2 h at 37°C). Excess beads were removed with ice-cold PBS and then stained for syntaxin 4 (1/500; Chemicon) (24). Cells and beads were fixed with paraformaldehyde and immunostained with Abs against the vesicular protein syntaxin 4. To distinguish intracellular from bound beads, 0.5-μm-thick confocal stacks were created under both differential interference contrast optics and fluorescent optics (for detection of syntaxin 4) with scans in the xy-z plane beginning at the level of the coverslip and extending to the very top of the cells. Intracellular beads (with fluorescent staining) could then be distinguished from noninternalized bound beads (with no fluorescent staining) by creating a composite (projected) image of the entire series. Where indicated, cells were pretreated with Abs against TLR4, cytochalasin D, or an irrelevant IgG. Male C3H/HeJ (bearing an inactivating mutation in TLR4) and C3H/HeOuJ mice (wild-type littermates) (The Jackson Laboratory) 8–12 wk of age were housed in accordance with University of Pittsburgh animal care guidelines. All animal studies were approved by the institutional review board at the University of Pittsburgh. After inhalational administration of isoflurane (Abbott Laboratories), mice were gavaged with 400 μl of E. coli that had been labeled with biotin as described above. Two hours later, animals were subjected to surgical stress to induce bacterial translocation across the gastrointestinal tract (25, 26, 27). Specifically, after s.c. Nembutal administration (Abbott Laboratories), mice underwent sterile dissection of the left groin and placement of a sterile tapered PE-10 catheter into the left femoral artery that was then connected to a blood pressure transducer. Mean arterial pressure was maintained within the normal range throughout the experiment. In the control group, no surgical procedure was performed after oral gavage of the bacterial suspension. After 6 h the mice were sacrificed, and the mesenteric lymph node complex and terminal ileum were harvested and flushed with ice-cold PBS (pH 7.4). To measure bacterial translocation across the intestinal epithelium, mesenteric lymph nodes were lysed by ultrasonication and plated onto agar for 25 h and examined for the expression of CFUs per gram of tissue. To determine whether bacteria were internalized by enterocytes, intestinal sections were fixed in 2% paraformaldehyde for 4 h and then transferred to 30% sucrose overnight before freezing at −80°C. Coronal sections (7-microns-thick) were then prepared, mounted on microscope slides, and then stained with rhodamine-streptavidin to identify biotin-labeled bacteria (1/250). Slides were stained with FITC-phalloidin (1/100) and Draq5 (Axxora Life Sciences) (1/500) and examined on an Olympus FluoView 1000 confocal microscope. For detection of TLR4 expression and distribution on enterocytes, mucosal scrapings were obtained from the terminal ilea of 6-wk-old C3H/HeOuJ mice and, along with lysates from T84 and IEC-6 enterocytes, subjected to SDS-PAGE (20 μg protein per lane). In parallel, sections of terminal ilea were prepared as described above and immunostained using Abs against TLR4. The phagocytic index was defined as the number of bacteria-containing cells per a confluent ×40 high-power field divided by the total number of cells in the field, expressed as a percentage. For quantification of the phagocytic index for a given condition, at least 150 fields were sequentially examined and enumerated per experimental condition. Statistical comparisons were performed by Student’s t test or ANOVA as indicated using GraphPad Instat software. We first sought to determine whether enterocytes possess the molecular machinery necessary for phagocytosis to occur. As is shown in Fig. 1⇓, transfected FcR was detected in IEC-6 (Fig. 1⇓, A and B) and CHO cells (Fig. 1⇓, E and F) at the cell periphery and intracellularly. Transfection of FcR allowed IEC-6 and CHO cells to internalize IgG-opsonized SRBCs, as can be clearly seen in the differential interference contrast images (Fig. 1⇓, B, D, F, and H). The phagocytic index of Fc-IEC-6 cells internalizing SRBC was 10 ± 3%, and that of Fc-CHO cells was 15 ± 2% (mean index of 10 separate experiments). Actin-rich cups accumulated around the internalized particle (Fig. 1⇓, C and G, arrows), consistent with the cytoskeletal arrangements that are known to accompany phagocytosis in other cells (28). Neither SRBC internalization nor actin cup formation were detected in nontransfected IEC-6 or CHO cells (not shown). Pretreatment of cells with cytochalasin D completely inhibited phagocytosis, as did incubation of cells with nonopsonized SRBCs (not shown). Together, these data demonstrate that IEC-6 enterocytes possess the molecular machinery required for phagocytosis to occur. 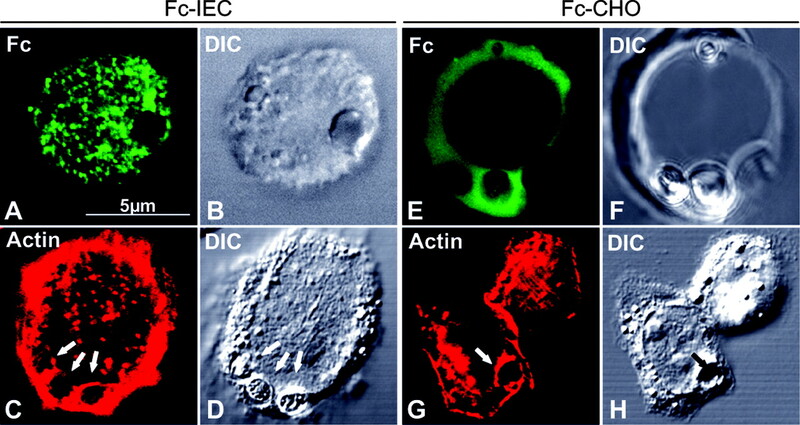 Fc-transfected enterocytes undergo phagocytosis of IgG-opsonized erythrocytes. IEC-6 enterocytes (A–D) or CHO cells (E–H) were stably transfected with FcγRIIa and allowed to internalize IgG-opsonized sheep erythrocytes. 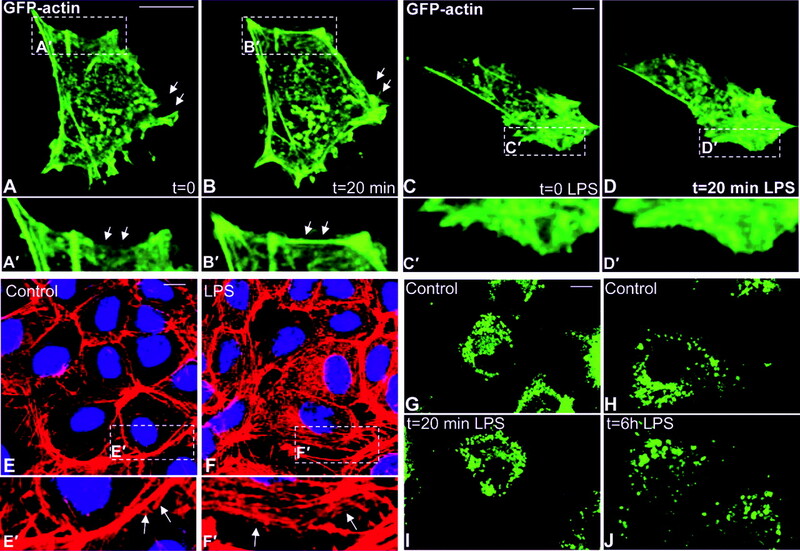 Cells were subjected to hypotonic lysis to remove extracellular particles, stained with either Abs against FcγRIIa (A, B, E, and F) or rhodamine phalloidin (C, D, G, and H), and assessed by confocal microscopy under fluorescent (A, C, E, and G) or transmission optics (B, D, F, and H). Fluorescent images reflect a composite stack projected after scanning from the bottom to the top of the cell. Arrows show the location of actin-rich cups around the phagosomes. Data are representative of at least five separate experiments. DIC, Differential interference contrast. To determine whether the expression of TLR4 could be detected on enterocytes, mucosal scrapings were obtained from the ileal mucosa of C3H/HeOuJ mice and subjected to SDS-PAGE along with J774 macrophages (positive control). As shown in Fig. 2⇓A, TLR4 was detected in mucosal scrapings from three different mice (designated M1, M2, and M3), as well as in lysates from two enterocyte cell lines, IEC-6 and T84 cells. The subcellular distribution of TLR4 in IEC-6 cells is demonstrated by Fig. 2⇓B, in which membrane staining as well as an intracellular distribution is observed. 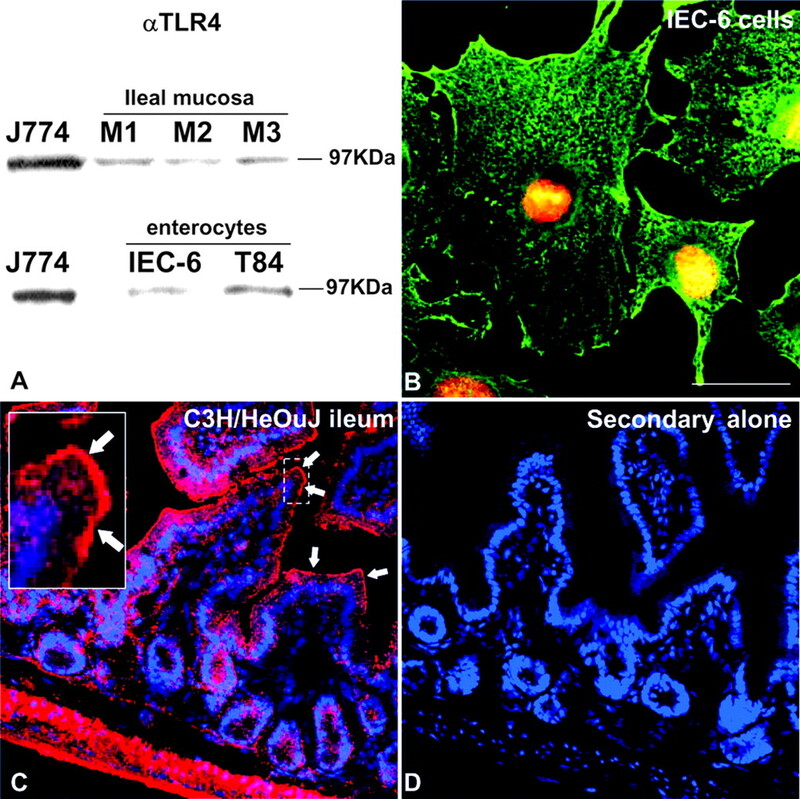 The distribution of TLR4 on the terminal in ileum of C3H/HeOuJ mice is shown in Fig. 2⇓C (see inset for further detail; arrows point to the TLR4 expression). Treatment of tissue with a secondary Ab alone revealed no staining, highlighting the specificity of these findings (Fig. 2⇓D). Together, these data indicate that enterocytes express TLR4 and suggest the possibility that this receptor may participate in the signaling events that could mediate bacterial internalization. Expression of TLR4 on the ileal mucosa of mice and on cultured enterocytes. A, Lysates were prepared from J774 macrophages, mucosal scrapings from the terminal ilea of 6-wk-old C3H/HeOuJ mice (samples from three such mice are shown, designated M1, M2, and M3), and the enterocyte cell lines IEC-6 and T84 and then electrophoresed and immunoblotted with affinity-purified polyclonal Abs against TLR4. Two separate blots are shown; the location of the 97-kDa molecular mass standard is shown. B, Representative image showing the subcellular distribution of TLR4 in IEC-6 cells, which have been immunostained with Abs to TLR4 (green) as well as the nuclear marker Draq-5 (orange). Size bar is 5 μm. C, Distal ileum from 6-wk-old C3H/HeOuJ mice stained with anti-TLR4 (red) and the nuclear marker Draq-5 (blue); inset reveals higher magnification of the indicated region of the sample. D, Terminal ileum treated as in C without the addition of the primary Ab, revealing nuclear staining alone. We next investigated whether enterocytes could phagocytose Gram-negative bacteria via TLR4. As described in Materials and Methods, internalized bacteria could be visualized under FITC optics only, whereas surface-bound bacteria could be visualized under both FITC and rhodamine optics. This allowed for the reliable distinction between internalized bacteria and bacteria that were simply cell-associated. No fluorescence could be detected in bacteria that were unlabeled. As shown in Fig. 3⇓, bacteria were consistently observed to be present within the cytoplasm of the enterocytes (Fig. 3⇓, A–C and M). The phagocytosis index for bacteria was 4.2 ± 0.5% (average of 15 separate experiments), which compares with a phagocytosis index of 10 ± 3% for internalization of opsonized SRBCs by Fc-transfected IEC-6 cells and an index of 15 ± 2% for internalization of labeled bacteria by J774 macrophages (average of three separate experiments). Pretreatment of IEC-6 cells with cytochalasin D completely prevented internalization (Fig. 3⇓, D–F and M), indicating a requirement for actin filament formation for the process. Strikingly, pretreatment of IEC-6 cells with affinity-purified Abs against TLR4 inhibited phagocytosis of E. coli by IEC-6 cells (Fig. 3⇓, G–I and M). Nonspecific IgG at equimolar concentrations had no effect on the process of internalization (Fig. 3⇓, J–L and M). Abs against TLR4 did not block the phagocytosis of IgG-coated SRBCs by Fc-transfected IEC-6 cells (data not shown). Pretreatment of cells with IL-1, which activates the signaling cascade downstream of TLR4 by activating IRAK-1, significantly increased the rate of phagocytosis compared with control cells (Fig. 3⇓M). IEC-6 enterocytes internalize E. coli in a TLR4-dependent manner. A–C, IEC-6 cells were allowed to internalize E. coli that had been biotinylated and labeled with Oregon Green isothiocyanate. To identify extracellular bacteria, cells were treated with rhodamine-streptavidin. Internalized bacteria (solid arrows) thus appear under FITC optics only (left column), whereas extracellular bacteria (open arrows) appear under both FITC and rhodamine optics (middle column). The phase contrast appearance and merged image of the green and red signal is shown (right column). D–L, Before phagocytosis, IEC-6 cells were treated with cytochalasin D (100 μM; 1 h) (D–F), Abs against TLR4 (G–I) or an irrelevant IgG (J–L). M, Quantification of phagocytosis as defined in Materials and Methods. Bars refer to the following treatment conditions: Ctl, untreated IEC-6 cells; CyD, cytochalasin D; TL4, Abs against TLR4; IL1, IL-1; IgG, irrelevant IgG. N, Viability of bacteria within enterocytes as determined by the protection from extracellular gentamicin. Where indicated, cells were pretreated with gentamicin (Gent), cytochalasin D (CytoD), Abs against TLR4 (αTLR4), or Triton X-100 (Triton; 0.1% in PBS). Data are representative of at least 15 separate experiments for which 150 fields per experiment were sampled. Error bars reflect mean phagocytosis index of these 15 experiments. ∗, p < 0.05 compared with control by ANOVA; ∗∗, p < 0.05 compared with control by Student’s t test; †, not significantly different compared with control; ▵, p < 0.05 compared with gentamicin alone by ANOVA. We next sought to determine the fate of the internalized particles within enterocytes. To assess the viability of the internalized bacteria, IEC-6 cells that had internalized E. coli were treated with gentamicin under conditions that prevent passage of the antibiotic into the cell. 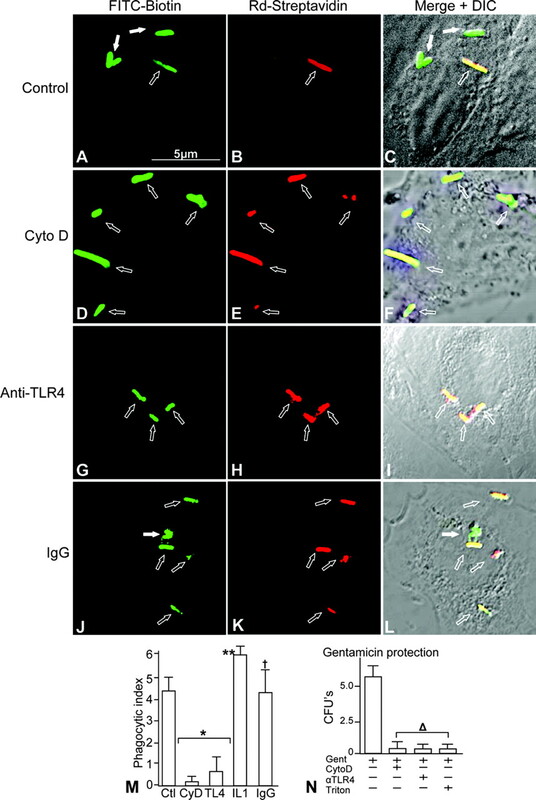 Internalized bacteria could be recovered from gentamicin-treated enterocytes after cell lysis, indicating that they remained viable within the phagosome (Fig. 3⇑N). No bacteria could be recovered after pretreatment with cytochalasin D or inhibitory Abs against TLR4 (Fig. 3⇑N), consistent with the inhibition of phagocytosis observed under these conditions (Fig. 3⇑M). Pretreatment of cells with Triton X-100 to allow gentamicin to enter the cell prevented the subsequent bacterial growth (Fig. 3⇑M). Together, these data strongly suggest that the internalized bacteria remain viable within the enterocyte. LPS does not induce increased ruffling or macropinocytosis in enterocytes and does not mediate the internalization of Gram-positive bacteria. Certain species of Gram-negative bacteria such as Salmonella typhimurium are known to enter epithelia by inducing membrane ruffling and macropinocytosis through actin remodeling (23, 29, 30, 31). This raises the possibility that activation of TLR4 by LPS could allow bacteria to enter enterocytes by inducing similar changes at the cell periphery. Therefore, we next sought to determine whether treatment of enterocytes with LPS would lead to the induction of actin-rich membrane ruffles and/or macropinocytosis. To address this directly, we examined the formation of actin ruffles on the membrane of IEC-6 cells using live cell confocal actin imaging after exposure to LPS. Specifically, IEC-6 cells were transiently transfected with GFP-conjugated actin (pGFP-actin) and transferred to the stage of an Olympus confocal microscope. Actin dynamics and the formation of actin ruffles were then assessed by obtaining images under low intensity laser illumination every 5 min for 20 min. In untreated cells (Fig. 4⇓, A and B), actin rearrangements were observed that included the formation of lamellipodia and stress fibers (see arrows). To assess whether conditions simulating the initial period of bacteria-enterocyte interactions could lead to membrane ruffling, pGFP-actin-transfected IEC-6 cells were treated in parallel with LPS, and the actin morphology was evaluated over the ensuing 20 min. The presence (or absence) of membrane ruffling at the cell surface was assessed by evaluating the edge of the cell under higher magnification. We determined that exposure to LPS did not induce membrane ruffling in enterocytes (Fig. 4⇓, C and D; compare the cell surface at higher magnification shown in C′ and D′ with that of A′ and B). Cells were evaluated for up to 1 h after exposure, and no ruffling was observed (shown in the Fig. 4⇓ are images taken at 20 min). These findings are consistent with results obtained in which the distribution of exogenous F-actin was assessed by rhodamine phalloidin at longer time points (6 h at 37°C) (Fig. 4⇓; arrows highlight the absence of ruffles at the cell periphery between untreated (Fig. 4⇓E) and LPS-treated cells (Fig. 4⇓F)). Similarly, there was no apparent effect of LPS on macropinocytosis. This finding is based upon the observation (Fig. 4⇓, G–J) that the uptake of macromolecular dextran was similar between untreated IEC-6 cells and IEC-6 cells that had been treated with LPS for 20 min (Fig. 4⇓, G vs I) or 6 h (Fig. 4⇓, H vs J; shown in Fig. 4⇓H are cells that were treated with vehicle (PBS) alone for 6 h). LPS does not induce membrane ruffling or macropinocytosis in enterocytes. A–D, IEC-6 cells were plated on glass coverslips and transfected with GFP-conjugated actin, transferred to the stage of an Olympus FluoView 1000 confocal microscope, and left either untreated (A and B) or treated with LPS (50 μg/ml for 20 min at 37°C) (C and D). Images are displayed at the start and end of the experiment and reveal changes in the distribution of actin into lamellipodia and stress fibers (arrows). A magnified view of the cell surface is shown in the insets (corresponding panels A′–D′). E and F, Phalloidin staining imaged at the plane of the coverslip in IEC-6 cells that were either untreated (E) or treated with LPS (for 6 h at 37°C) (F). The insets (E′ and F′) show a magnified view of the indicated region to highlight the appearance of the cell periphery (arrows) where actin ruffles would be expected to form. G–J, IEC-6 cells were either untreated (G and H) or treated with LPS (50 μg/ml) for 20 min (I) or 6 h (J) at 37°C and then allowed to internalize Alexa Fluor 594-conjugated 10-kDa dextran for 10 min as described in Materials and Methods. Data are representative of at least three separate experiments. To evaluate further whether the addition of exogenous LPS could cause changes in the surface of the enterocytes leading to particle internalization, we next examined whether LPS could induce the uptake of adherent particles that are not coated with LPS. As shown in Fig. 5⇓, IEC-6 cells were found to internalize Streptococcus sp. (Fig. 5⇓, A–C and G) at low but measurable rates. Importantly, the addition of exogenous LPS (50 μg/ml; Fig. 5⇓, D–F and G) did not affect the rate of internalization of these Gram-positive bacteria. Taken together, these data support the notion that the TLR4-dependent uptake of Gram-negative bacteria by enterocytes does not occur through enhanced ruffling or macropinocytosis at the cell surface in response to LPS, but they rather suggest that a more specific process akin to phagocytosis occurs. The addition of LPS does not increase the uptake of Gram-positive bacteria by enterocytes. A–C, IEC-6 cells were allowed to internalize Streptococcus sp. that had been biotinylated and labeled with Oregon Green isothiocyanate. To identify extracellular bacteria, cells were treated with rhodamine-streptavidin (Rd-Streptavidin). Internalized bacteria (solid arrows) thus appear under FITC optics only (left column), whereas extracellular bacteria (open arrows) appear under both FITC and rhodamine optics (middle column). The phase contrast appearance and merged image of the green and red signal is shown (right column). D–F, Before phagocytosis, IEC-6 cells were treated with LPS (50 μg/ml for 6 h). G, Quantification of phagocytosis as defined in Materials and Methods. Bars refer to the following treatment conditions: Ctl, untreated IEC-6 cells; LPS, LPS-treated cells. Data are representative of three separate experiments for which 150 fields per experiment were sampled. No significant differences between groups were found by Student’s t test. Two lines of evidence suggest that TLR4 is necessary and sufficient for phagocytosis by epithelial cells. First, LPS-conjugated beads were rapidly internalized by IEC-6 cells (Fig. 6⇓, A and B). Internalization did not occur in the presence of cytochalasin D or Abs against TLR4 or in the presence of nonconjugated beads (Fig. 6⇓C). Importantly, syntaxin 4 (a vesicular protein that is known to accumulate on the phagosomal membrane) (24) was detected in the region of the phagosomal membrane surrounding the internalized beads (Fig. 6⇓, A and B) as well as that surrounding internalized E. coli (not shown), implying that the enterocyte phagosome may fuse with other membrane-bound organelles. Importantly, there is a requirement for LPS to be on the surface of the beads for internalization to occur, because the addition of soluble LPS to the cells was insufficient to trigger the uptake of nonlabeled beads. TLR4 is necessary and sufficient to mediate phagocytosis of bacteria by epithelial cells. A–C, IEC-6 cells were allowed to internalize LPS-conjugated latex beads and then stained for the endosomal marker syntaxin 4. A, Differential interference contrast (DIC) image of enterocyte with associated particles B, Syntaxin 4 (Syn4) in the region of the internalized particle. C, Quantification of phagocytosis (as described in Materials and Methods) by IEC-6 cells of LPS-conjugated latex beads (Ctrl), beads not labeled with LPS (no LPS), or IEC-6 cells pretreated with Abs against TLR4 (αTLR), cytochalasin D (CytD), or a nonspecific IgG (IgG). D–I, HEK-293 (D–F) or TLR4/MD2-transfected HEK-293 cells (G–I) were incubated with Oregon Green, biotin-labeled E. coli, and phagocytosis was assessed as described in Materials and Methods. Intracellular bacteria (solid arrows) appear under FITC optics only (D and G), whereas extracellular bacteria (open arrows) appear under FITC and rhodamine (Rd) optics (E and H). J, Quantification of phagocytosis by nontransfected HEK-293 cells (HEK-293), TLR4/MD2-transfected HEK-293 cells (HEK-TLR), cytochalasin D-treated HEK-TLR4/MD2 cells (HEK-TLR4 + Cyto D), and HEK-293 cells transfected with MD-2 and TLR4 bearing a dn P712H mutation (HEK-dnTLR) as defined in Materials and Methods. Data are representative of at least 15 separate experiments. ∗, p < 0.05 compared with control by ANOVA; ∗∗, not significantly different from control by Student’s t test; †, p < 0.05 compared with HEK-293 cells by ANOVA; ††, not significantly different compared with HEK-293 cells by ANOVA. Further evidence that supports a critical role for intact TLR4 signaling in the phagocytosis of bacteria by epithelial cells was obtained from studies performed on HEK-293 cells transfected with MD-2 and either wild-type TLR4 or TLR4 bearing a dn P712H mutation (32). Nontransfected HEK-293 cells that do not express TLR4 (33) were incapable of undergoing phagocytosis (Fig. 6⇑, D–F and J). Strikingly, transfection of TLR4 conferred the ability of these cells to undergo phagocytosis (Fig. 6⇑, G-I and J). Pretreatment with cytochalasin D completely inhibited phagocytosis in TLR4-HEK-293 cells (Fig. 6⇑J). HEK-293 cells transfected with TLR4 bearing the P712H mutation that prevents intact receptor signaling were unable to undergo phagocytosis (Fig. 6⇑J). Together, these data indicate that intact TLR4 is necessary and sufficient to facilitate phagocytosis of bacteria by epithelial cells. Translocation of bacteria has been shown to occur following minor surgical stress in rodents during conditions in which the intestinal barrier integrity remains intact (25, 26, 27, 34). We have recently shown TLR4 to be present on the apical surface of enterocytes in vivo in neonatal rats (19) and in adult mice (Fig. 2⇑). Therefore, to examine whether TLR4 was required for bacterial translocation in vivo, wild-type and TLR4 mutant mice (C3H/HEJ) were subjected to a minor surgical injury, and bacterial translocation was measured by culturing mesenteric lymph nodes. As shown in Fig. 7⇓A, TLR4 mutant mice demonstrated significantly reduced rates of bacterial translocation as compared with wild-type littermates. Minimal bacterial translocation was detected in either mouse strain in the absence of surgical stress (Fig. 7⇓A). Importantly, the increase in bacterial translocation following surgical stress in mice with intact TLR4 was associated with a corresponding increase in the accumulation of labeled E. coli within enterocytes (Fig. 7⇓B). Representative immunohistological images from which the quantification in Fig. 7⇓B was based are shown in Fig. 7⇓, C–F. Specifically, images of the terminal ileum of wild-type and C3N/HEJ mice in the presence (Fig. 7⇓, C and D) or absence (Fig. 7⇓, E and F) of remote surgical stress are shown. Note the intact intestinal epithelium and the absence of an inflammatory reaction after the local injury, suggesting that changes in bacterial translocation do not reflect a disruption in the barrier or enhanced chemotaxis by inflammatory cells. Biotin-labeled bacteria that had been administrated orally 6 h before sacrifice were consistently detected within the cytoplasm of the ileal enterocytes in wild-type mice using rhodamine-streptavidin as a marker (see Fig. 7⇓C for a representative image), yet these bacteria could only be found within the lumen (and rarely within the enterocyte) of TLR4 mutant C3N/HEJ strains (Fig. 7⇓D). Labeled bacteria were not found within the enterocytes of uninjured mice of either strain (Fig. 7⇓, E and F). No bacteria were detected in the absence of biotin labeling or after treating tissue with rhodamine-streptavidin alone (not shown). Together, these data provide evidence that TLR4 is required for bacterial translocation in vivo, potentially through a pathway involving phagocytosis of bacteria across the enterocyte monolayer. 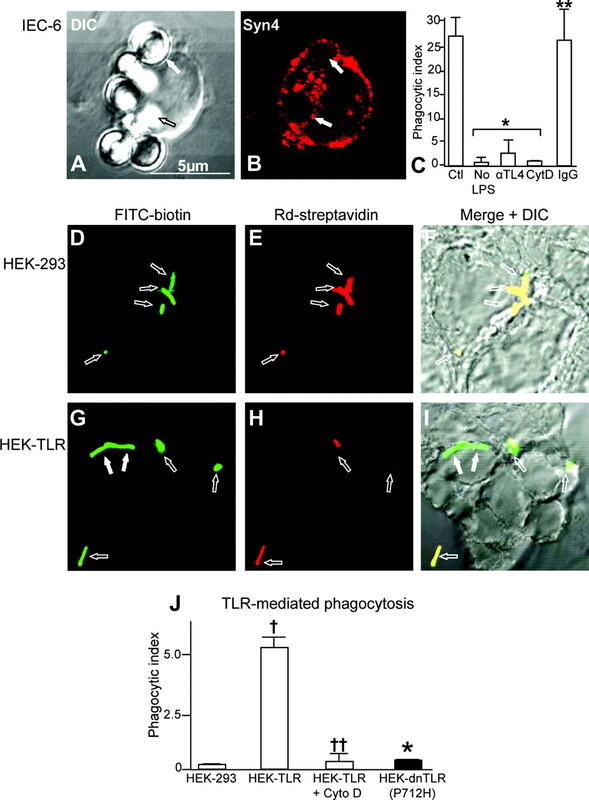 TLR4 mediates phagocytosis of bacteria by enterocytes and bacterial translocation in vivo. Six-wk-old mice, either wild type (WT; solid bars) or TLR4 mutant (HEJ, open bars), were gavage-fed biotinylated E. coli and subjected to conditions that promote bacterial translocation (Injury). Control animals underwent gavage feeding only (Control). A, Bacterial CFUs obtained from mesenteric lymph nodes, normalized per gram of cultured lymph node. B, Bacterial uptake into enterocytes in vivo (as defined in Materials and Methods). C–F, Tissue sections from mice that were stained with rhodamine-streptavidin (red), FITC-phalloidin (green), and the nuclear marker Draq-5 (blue). Arrows indicate biotin-labeled, gavage-fed bacteria, with magnified views of the region shown in the insets (C′–F′). Representative images are shown in C–F under the following conditions: wild-type mice subjected to trauma (C); TLR4-mutant mice subjected to trauma (D); wild-type mice not subjected to trauma (E); and TLR4-mutant mice not subjected to trauma (F) (representative of eight separate experiments). ∗, p < 0.005 (injury HEJ compared with injury WT); ∗∗, p < 0.05 (control HEJ or WT compared with injury WT, by Student’s t test). We now provide evidence that enterocytes are capable of internalizing Gram-negative bacteria in a TLR4-dependent manner, that the internalized microbes remain viable within the enterocyte, and that TLR4 is required for bacterial translocation to occur. The pattern by which internalization of bacteria by enterocytes occurs appears to be similar to the process of phagocytosis as it occurs in leukocytes in that it requires a redistribution of the F-actin cytoskeleton (i.e., it may be inhibited by cytochalasin), involves the uptake of large (∼1-μm diameter) particles (35), and is mediated by a transmembrane receptor (in this case TLR4). TLRs have recently been shown to be recruited to phagosomes, where they may sample the contents of the compartment for microbial products (36). However, a role for TLR4 in mediating phagocytosis by nonmyeloid cells has not been demonstrated previously. Moreover, although previous authors have shown that noninvasive bacteria may be detected within enterocytes (6, 12), ours is the first study to document a potential mechanism by which this could occur and to identify a potential role for TLR4-mediated phagocytosis of bacteria by enterocytes in the process. It is noteworthy that the current findings indicate that enterocytes express and respond to TLR4. There has been significant controversy surrounding the expression and function of TLR4 in intestinal epithelial cell lines, although the balance of studies now support the finding that enterocytes do express TLR4 and that its activity may be regulated (37). Specifically, it has been demonstrated that rat IEC-6 enterocytes (38), primary colonocytes (21), HT-29 and T84 colonocytes (20, 39), and mouse rectal CMT93 cells (20) express TLR4, MD-2 and MyD88 and that activation by LPS leads to changes in proliferation (38), IL-8 release (21, 39), intracellular trafficking of TLR4 (40), and NF-κB activation (20). The extent of the response to LPS in enterocytes may be increased by IFN-α and -γ by increasing the expression of MD-2 and TLR4 (41, 42) or decreased over time through a decrease in TLR4 expression and an increase in the inhibitory Toll-interacting protein (Tollip) (21). However, this latter finding lies in opposition to that of Hornef et al. (43) who demonstrated that, in a small intestinal cell line, continuous exposure to LPS did not alter TLR4 expression. Some cell lines, such as small intestinal IEC-6 cells, are more sensitive to LPS signaling than others, such as colonic Caco-2 cells, and inherent differences in LPS sensitivity may be reflective of differences in TLR4 expression and/or activity between cell types (42, 44). Importantly, patients with inflammatory bowel disease demonstrate an increase in TLR4 expression in the intestinal mucosa (45), and we have found that TLR4 expression is increased in experimental necrotizing enterocolitis, an inflammatory condition of the gastrointestinal tract that affects newborn infants (C. Leaphart and D. Hackman, manuscript in preparation). 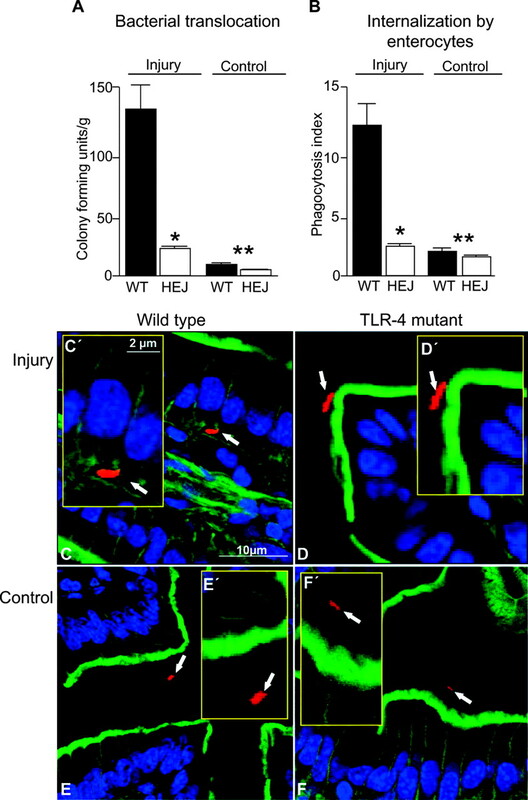 These findings strongly indicate that enterocytes express TLR4 in vitro and in vivo and raise the possibility that TLR4 signaling in the enterocyte may participate in diseases of gut inflammation. We now postulate that the activation of a variety of signaling pathways in the enterocyte by endotoxin determines the overall responsiveness to LPS and that it is the precise control of these pathways that determines the ultimate effect of TLR4 in mediating phagocytosis. A major finding of the current study is that TLR4 is necessary for the phagocytosis of Gram-negative bacteria by enterocyte and that this protein complex is sufficient to confer a phagocytic phenotype on HEK-293 cells that are otherwise nonphagocytic. This finding represents a potentially new role for this molecule in nonprofessional phagocytes such as intestinal epithelial cells and provides an additional rationale for the presence of TLRs on the intestinal lining (20, 21, 37). Although it is not immediately apparent as to how activation of TLR4 leads to phagocytosis, intact receptor signaling is required, because HEK-293 cells that were transfected with TLR4 bearing the P712H mutation, which prevents receptor signaling, were unable to undergo phagocytosis (Fig. 6⇑J). One potential mechanism may involve activation of the IRAK-MAPK signaling pathway with the subsequent redistribution of the actin cytoskeleton (46). Actin filament polymerization could then drive extension of the pseudopod and lead to particle engulfment (47). This notion is supported by the fact that the loss of TLR4 leads to an inhibition of particle internalization in macrophages (48) and that changes in TLR4 activation lead to alterations in the actin network of macrophages (36, 49). We now propose that TLR4 activation by endotoxin on the surface of Gram-negative bacteria is required for the alterations in the actin cytoskeleton leading to phagocytosis. Of note, the bacteria themselves may not need to bind directly to the TLR4 complex on the cell surface in order for phagocytosis to occur; it may be sufficient that the signal be conveyed and that the subcortical actin network be rearranged in order for the process to be initiated (50, 51). As described in Fig. 7⇑, we now suggest that TLR4 is required for bacterial translocation across the intact intestinal epithelium and that the internalization of bacteria by enterocytes in vivo may lead to differences in the rates of bacterial translocation observed between wild type and TLR4 mutant mice strains. This role for TLR4 is consistent with our recent findings that TLR4 is localized on the apical surface of the enterocyte in vivo (Fig. 2⇑ and Ref.19). Because the enterocyte is constantly exposed to a variety of LPS-expressing bacteria, it is likely that other signaling pathways serve to regulate the expression and/or activity of TLR4 on enterocytes at baseline and during inflammation (52), which could in turn affect the extent to which TLR4-mediated internalization and translocation of bacteria occurs. It is noteworthy that a recent study by Fukata et al. (53) demonstrated that bacterial translocation to mesenteric lymph nodes was increased in TLR4 knockout mice compared with wild-type controls after dextran sodium sulfate-induced colitis. Although it may appear that the results of Fukata et al. (53) run counter to the current study, an important difference lies in the fact that Fukata et al. (53) assessed bacterial translocation after a chemical injury to the colonic epithelium had been induced. Moreover, the extent of intestinal injury induced by dextran sodium sulfate has recently been shown to be greater in TLR4 and MyD88 knockout mice as compared with wild-type controls (2). Taken together, it is likely that the relative increase in bacterial translocation observed in TLR4 deficient mice by Fukata et al. (53) reflects the passage of bacteria across an injured epithelium and that TLR4 is required to limit the extent of intestinal injury from occurring (2, 53). After intestinal injury, bacterial translocation to mesenteric lymph nodes may be predominantly regulated by internalization and delivery by macrophages and neutrophils (53) as well as by paracellular passage through disrupted tight junctions (5). In our study, the minor stress response initiated by anesthesia and surgical incision was adequate to activate the translocation process in mice without disrupting the epithelial integrity. Although our results do not demonstrate how the TLR4-associated uptake of bacteria is activated in vivo, we do show that the process is not active at baseline (i.e., in the absence of injury) (Fig. 7⇑A). It may be that the epithelium is programmed to sample the luminal contents upon acute traumatic stress as a mechanism to regulate the activation of the innate immune system. It is apparent from the current studies that the TLR4 mutant mice do not demonstrate different degrees of intestinal inflammation in response to the surgical stress as compared with the wild-type littermates. Thus, it is unlikely that differences in the accumulation of leukocytes could explain the differences in bacterial translocation observed between the mice strains. It is important to point out that mechanisms other than phagocytosis of bacteria by enterocytes may contribute to both bacterial internalization and translocation. For instance, it is known that Salmonella enters epithelial cells by stimulating macropinocytosis and membrane ruffles (23, 29, 30, 31). This raises the possibility that TLR4-mediated entry of Gram-negative bacteria into enterocytes may occur in a similar fashion. However, activation of TLR4 by the addition of exogenous LPS did not cause any changes in the extent of membrane ruffling or in macropinocytosis in enterocytes (Fig. 4⇑), and exogenous LPS did not enhance the uptake of adherent Gram-positive bacteria that do not express LPS (Fig. 5⇑). It should also be considered that we have not provided direct evidence that it is the TLR4 expressed on enterocytes that mediates bacterial uptake and translocation in vivo. TLR4 expressed on subepithelial macrophages of other professional phagocytes could well be involved via the protrusion of processes between the enterocytes, as has been recently described (54, 55). It is quite possible that this mechanism may be of equal or greater importance in the processes governing bacterial translocation across the impermeant barrier, or it may function in concert with enterocyte-mediated internalization and translocation. This apparent controversy may be only directly resolved by performing studies in animals with enterocyte-targeted deletions of or mutations in TLR4. In summary, we have now shown that enterocytes are capable of undergoing phagocytosis of Gram-negative bacteria and that TLR4 is required for this process. We have also identified a potential role for TLR4 in the process of bacterial translocation in vivo. These studies suggest a possible role for the innate immune system in governing bacterial translocation and provide a basis for further studies on the molecular pathways within enterocytes that are activated upon the interaction of TLR4 with bacterial ligands. We gratefully acknowledge the expertise and advice of Dr. Sergio Grinstein (Toronto, Canada) and the critical insights of Drs. Rosemary Hoffman, Jeffrey Upperman, Ruben Zamora, and Anatoly Grishin (Pittsburgh, PA). We also acknowledge Dr. Evelyn Kurt Jones (University of Massachusetts Medical School, Worcester, MA) for the gifts of TLR4 and MD-2 constructs. Don Phillibert and Matthew Rivenburgh (University of Pittsburgh School of Medicine, Pittsburgh, PA) are acknowledged for technical assistance. The authors have no conflicting financial interests pertaining to the current study. ↵2 Abbreviations used in this paper: CHO, Chinese hamster ovary; dn, dominant negative; HEK, human embryonic kidney; IRAK, IL-1R-associated kinase; SRBC, sheep RBC. Strober, W., I. J. Fuss, R. S. Blumberg. 2002. The immunology of mucosal models of inflammation. Annu. Rev. Immunol. 20: 495-549. Rakoff-Nahoum, S., J. Paglino, F. Eslami-Varzaneh, S. Edberg, R. Medzhitov. 2004. Recognition of commensal microflora by Toll-like receptors is required for intestinal homeostasis. Cell 118: 229-241. Swidsinski, A., A. Laddhoff, A. Pernthaler, S. Swidsinski, V. Loening-Baucke, M. Ortner, J. Weber, U. Hoffmann, S. Schreiber, M. Dietel, H. Lochs. 2002. Mucosal flora in inflammatory bowel disease. Gastroenterology 122: 44-54. Fink, M. P., R. L. Delude. 2005. Epithelial barrier dysfunction: a unifying theme to explain the pathogenesis of multiple organ dysfunction at the cellular level. Crit. Care Clin. 21: 177-196. Han, X., M. P. Fink, R. L. Delude. 2003. Proinflammatory cytokines cause NO-dependent and -independent changes in expression and localization of tight junction proteins in intestinal epithelial cells. Shock 19: 229-237. Wells, C. L., R. P. Jechorek, S. B. Olmsted, S. L. Erlandsen. 1994. Bacterial translocation in cultured enterocytes: magnitude, specificity, and electron microscopic observations of endocytosis. Shock 1: 443-451. Clark, E., C. Hoare, J. Tanianis-Hughes, G. L. Carlson, G. Warhurst. 2005. Interferon γ induces translocation of commensal Escherichia coli across gut epithelial cells via a lipid raft-mediated process. Gastroenterology 128: 1258-1267. Nakayama, M., M. Yajima, S. Hatano, T. Yajima, T. Kuwata. 2003. Intestinal adherent bacteria and bacterial translocation in breast-fed and formula-fed rats in relation to susceptibility to infection. Pediatr. Res. 54: 364-371. Lee, W. L., R. E. Harrison, S. Grinstein. 2003. Phagocytosis by neutrophils. Microbes Infect. 5: 1299-1306. Hackam, D. J., O. Rotstein, C. Sjolin, A. Schreiber, W. Trimble, S. Grinstein. 1998. v-SNARE-dependent secretion is required for phagocytosis. Proc. Natl. Acad. Sci. USA 95: 11691-11696. Hess, D. J., M. J. Henry-Stanley, E. A. Erickson, C. L. Wells. 2003. 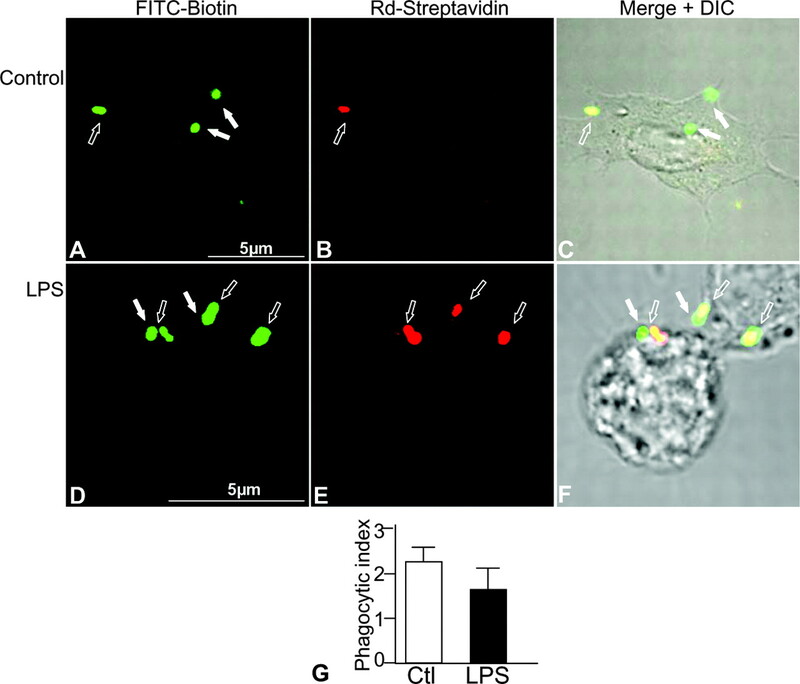 Intracellular survival of Staphylococcus aureus within cultured enterocytes. J. Surg. Res. 114: 42-49. Downey, G. P., R. J. Botelho, J. R. Butler, Y. Moltyaner, P. Chien, A. D. Schreiber, S. Grinstein. 1999. Phagosomal maturation, acidification, and inhibition of bacterial growth in nonphagocytic cells transfected with FcγRIIA receptors. J. Biol. Chem. 274: 28436-28444. Lemaitre, B., E. Nicolas, L. Michaut, J. M. Reichhart, J. A. Hoffmann. 1996. The dorsoventral regulatory gene cassette spätzle/Toll/cactus controls the potent antifungal response in Drosophila adults. Cell 86: 973-983. Akira, S., K. Takeda, T. Kaisho. 2001. Toll-like receptors: critical proteins linking innate and acquired immunity. Nat. Immunol. 2: 675-680. Poltorak, A., X. He, I. Smirnova, M. Y. Liu, C. Van Huffel, X. Du, D. Birdwell, E. Alejos, M. Silva, C. Galanos, et al 1998. Defective LPS signaling in C3H/HeJ and C57BL/10ScCr mice: mutations in Tlr4 gene. Science 282: 2082-2088. Cetin, S., H. R. Ford, L. R. Sysko, C. Agarwal, J. Wang, M. D. Neal, C. Baty, G. Apodaca, D. J. Hackam. 2004. Endotoxin inhibits intestinal epithelial restitution through activation of Rho-GTPase and increased focal adhesions. J. Biol. Chem. 279: 24592-24600. Cario, E., I. M. Rosenberg, S. L. Brandwein, P. L. Beck, H.-C. Reinecker, D. K. Podolsky. 2000. Lipopolysaccharide activates distinct signaling pathways in intestinal epithelial cell lines expressing Toll-like receptors. J. Immunol. 164: 966-972. Otte, J.-M., E. Cario, D. Podolsky. 2004. Mechanisms of cross hyporesponsiveness to Toll-like receptor bacterial ligands in intestinal epithelial cells. Gastroenterology 126: 1054-1070. Ellerbroek, S. M., K. Wennerberg, W. T. Arthur, J. M. Dunty, D. R. Bowman, K. A. DeMali, C. Der, K. Burridge. 2004. SGEF, a RhoG guanine nucleotide exchange factor that stimulates macropinocytosis. Mol. Biol. Cell 15: 3309-3319. Jones, B., H. Paterson, A. Hall, S. Falkow. 1993. Salmonella typhimurium induces membrane ruffling by a growth factor receptor-independent mechanism. Proc. Natl. Acad. Sci. USA 90: 10390-10394. Hackam, D. J., O. Rotstein, M. Bennett, A. Klip, S. Grinstein, M. Manolson. 1996. Characterization and subcellular localization of target membrane soluble NS attachment protein receptors (t-SNAREs) in macrophages: syntaxins 2, 3, and 4 are present on phagosomal membranes. J. Immunol. 11: 4377-4383. Oztuna, V., G. Ersoz, I. Ayan, M. M. Eskandari, K. Uguz, F. Kuyurtar. 2004. Head injury-associated bone fractures induce bacterial translocation: an experimental study. J. Orthop. Trauma 18: 92-95. Prabhu, R., K. A. Balasubramanian. 2004. Altered glycosylation of surfactant and brush border membrane of the small intestine in response to surgical manipulation. J. Surg. Res. 117: 272-282. Anup, R., V. Aparna, A. Pulimood, K. Balasubramanian. 1999. Surgical stress and the small intestine: role of oxygen free radicals. Surgery 125: 560-569. Scott, C. C., W. Dobson, R. J. Botelho, N. Coady-Osberg, P. Chavrier, D. A. Knecht, C. Heath, P. Stahl, S. Grinstein. 2005. Phosphatidylinositol-4,5-bisphosphate hydrolysis directs actin remodeling during phagocytosis. J. Cell Biol. 169: 139-149. Francis, C., T. Ryan, B. Jones, S. Smith, S. Falkow. 1993. Ruffles induced by Salmonella and other stimuli direct macropinocytosis of bacteria. Nature 364: 639-642. Boddicker, J. D., B. D. Jones. 2004. Lon protease activity causes down-regulation of Salmonella pathogenicity island 1 invasion gene expression after infection of epithelial cells. Infect. Immun. 72: 2002-2013. Terebiznik, M., O. Vieira, S. Marcus, A. Slade, C. Yip, W. Trimble, T. Meyer, B. Finlay, S. Grinstein. 2002. Elimination of host cell PtdIns(4,5)P(2) by bacterial SigD promotes membrane fission during invasion by Salmonella. Nat. Cell. Biol. 4: 766-773. Malley, R., P. Henneke, S. C. Morse, M. J. Cieslewicz, M. Lipsitch, C. M. Thompson, E. Kurt-Jones, J. C. Paton, M. R. Wessels, D. T. Golenbock. 2003. Recognition of pneumolysin by Toll-like receptor 4 confers resistance to pneumococcal infection. Proc. Natl. Acad. Sci. USA 100: 1966-1971. Lien, E., J. C. Chow, L. D. Hawkins, P. D. McGuinness, K. Miyake, T. Espevik, F. Gusovsky, D. T. Golenbock. 2001. A novel synthetic acyclic lipid A-like agonist activates cells via the lipopolysaccharide/Toll-like receptor 4 signaling pathway. J. Biol. Chem. 276: 1873-1880. Deitch, E., R. Bridges. 1987. Effect of stress and trauma on bacterial translocation from the gut. J. Surg. Res. 42: 536-542. Swanson, J. A., A. D. Hoppe. 2004. The coordination of signaling during Fc receptor-mediated phagocytosis. J. Leukocyte Biol. 76: 1093-1103. Underhill, D. M., B. Gantner. 2004. Integration of Toll-like receptor and phagocytic signaling for tailored immunity. Microbes Infect. 6: 1368-1373. Abreu, M. T., M. Fukata, M. Arditi. 2005. TLR signaling in the gut in health and disease. J. Immunol. 174: 4453-4460. Ruemmele, F. M., J. F. Beaulieu, S. Dionne, E. Levy, E. G. Seidman, N. Cerf-Bensussan, M. J. Lentze. 2002. Lipopolysaccharide modulation of normal enterocyte turnover by Toll-like receptors is mediated by endogenously produced tumour necrosis factor α. Gut 51: 842-848. Funda, D. P., L. Tuckova, M. A. Farre, T. Iwase, I. Moro, H. Tlaskalova-Hogenova. 2001. CD14 is expressed and released as soluble cd14 by human intestinal epithelial cells in vitro: lipopolysaccharide activation of epithelial cells revisited. Infect. Immun. 69: 3772-3781. Cario, E., D. Brown, M. McKee, K. Lynch-Devaney, G. Gerken, D. Podolsky. 2002. Commensal-associated molecular patterns induce selective Toll-like receptor trafficking from apical membrane to cytoplasmic compartments in polarized intestinal epithelium. Am. J. Pathol. 160: 165-173. Abreu, M. T., E. T. Arnold, L. S. Thomas, R. Gonsky, Y. Zhou, B. Hu, M. Arditi. 2002. TLR4 and MD-2 expression is regulated by immune-mediated signals in human intestinal epithelial cells. J. Biol. Chem. 277: 20431-20437. Abreu, M. T., P. Vora, E. Faure, L. S. Thomas, E. T. Arnold, M. Arditi. 2001. Decreased expression of Toll-like receptor-4 and MD-2 correlates with intestinal epithelial cell protection against dysregulated proinflammatory gene expression in response to bacterial lipopolysaccharide. J. Immunol. 167: 1609-1616. Hornef, M. W., T. Frisan, A. Vandewalle, S. Normark, A. Richter-Dahlfors. 2002. Toll-like receptor 4 resides in the Golgi apparatus and colocalizes with internalized lipopolysaccharide in intestinal epithelial cells. J. Exp. Med. 195: 559-570. Suzuki, M., T. Hisamatsu, D. K. Podolsky. 2003. Gamma interferon augments the intracellular pathway for lipopolysaccharide (LPS) recognition in human intestinal epithelial cells through coordinated up-regulation of LPS uptake and expression of the intracellular Toll-like receptor 4-MD-2 complex. Infect. Immun. 71: 3503-3511. Cario, E., D. K. Podolsky. 2000. Differential alteration in intestinal epithelial cell expression of Toll-like receptor 3 (TLR3) and TLR4 in inflammatory bowel disease. Infect. Immun. 68: 7010-7017. Cuschleri, J., D. Gourlay, I. Garcia, S. Jelacic, R. V. Maier. 2003. Endotoxin-induced endothelial cell proinflammatory phenotypic differentiation requires stress fiber polymerization. Shock 19: 433-439. Coppolino, M. G., R. Dierckman, J. Loijens, R. F. Collins, M. Pouladi, J. Jongstra-Bilen, A. D. Schreiber, W. S. Trimble, R. Anderson, S. Grinstein. 2002. Inhibition of phosphatidylinositol-4-phosphate 5-kinase Iα impairs localized actin remodeling and suppresses phagocytosis. J. Biol. Chem. 277: 43849-43857. Shiratsuchi, A., I. Watanabe, O. Takeuchi, S. Akira, Y. Nakanishi. 2004. Inhibitory effect of Toll-like receptor 4 on fusion between phagosomes and endosomes/lysosomes in macrophages. J. Immunol. 172: 2039-2047. Honstettre, A., E. Ghigo, A. Moynault, C. Capo, R. Toman, S. Akira, O. Takeuchi, H. Lepidi, D. Raoult, J.-L. Mege. 2004. Lipopolysaccharide from Coxiella burnetii is involved in bacterial phagocytosis, filamentous actin reorganization, and inflammatory responses through Toll-like receptor 4. J. Immunol. 172: 3695-3703. Hackam, D. J., O. Rotstein, A. Schreiber, W. Zhang, S. Grinstein. 1997. Rho is required for the initiation of calcium signaling and phagocytosis by Fcγ receptors in macrophages. J. Exp. Med. 186: 955-966. Hackam, D. J., J. S. Upperman, A. Grishin, H. R. Ford. 2005. Disordered enterocyte signaling and intestinal barrier dysfunction in the pathogenesis of necrotizing enterocolitis. Semin. Pediatr. Surg. 14: 49-57. Lan, J. G., S. M. Cruickshank, J. C. Singh, M. Farrar, J. P. Lodge, P. J. Felsburg, S. R. Carding. 2005. Different cytokine response of primary colonic epithelial cells to commensal bacteria. World J. Gastroenterol. 11: 3375-3384. Fukata, M., K. S. Michelsen, R. Eri, L. S. Thomas, B. Hu, K. Lukasek, C. C. Nast, J. Lechago, R. Xu, Y. Naiki, et al 2005. Toll-like receptor-4 is required for intestinal response to epithelial injury and limiting bacterial translocation in a murine model of acute colitis. Am. J. Physiol. 288: G1055-G1065. Rescigno, M., M. Urbano, B. Valzasina, M. Francolini, G. Rotta, R. Bonasio, F. Granucci, J.-P. Kraehenbuhl, P. Ricciardi-Castagnoli. 2001. Dendritic cells express tight junction proteins and penetrate gut epithelial monolayers to sample bacteria. Nat. Immunol. 2: 361-367. Niess, J., S. Brand, X. Gu, L. Landsman, S. Jung, B. McCormick, J. Vyas, M. Boes, H. Ploegh, J. Fox, et al 2005. CX3CR1-mediated dendritic cell access to the intestinal lumen and bacterial clearance. Science 307: 254-258.